Profile Response – Shannon Garrity and Chip Noble, DeLorme | How Will We Live Tomorrow? Bicyclists stop to explore what cars zoom by. I had passed DeLorme’s headquarters building with its glass atrium and giant globe along Route 1 in Yarmouth, ME dozens of times but never stopped. Now, at a slower pace, I not only stopped. I listened. Eartha, the world’s largest globe, consumes the company’s three-story atrium. We are used to globes we hold in our hands or twirl on a desk. But this 42-foot diameter model (1:1,000,000 scale, an inch is just under 16 miles) changes our relationship to the world. I always knew that the Pacific Ocean occupies half the earth, but until I stood on the balcony and watched this tilted orb spin until all the land disappeared (save lonely Hawaii), I never really understood that ocean’s immensity. Nor did I understand how contracted land is at 40 degrees latitude; flat maps contort that. Nor did my daughter Abby in Cambodia ever seem so far away. Like an aquarium, Eartha captivates your eyes and triggers your imagination. But Shannon Garrity woke me from reverie and escorted me to an upstairs conference room where she and Chip Noble discussed how will we live tomorrow from a Delorme perspective. DeLorme began over thirty years ago as company that made Atlases. The first one was Maine, organized in a book that graphed the entire state in scale and register. Everyone I’ve ever known from Maine swears by their Gazetteer. DeLorme, the leader in detailed maps, now makes them for every state. But paper maps are hardly cutting edge. Tomorrow lies in tracking – knowing where people and vehicles are in real time. And all the data that DeLorme has to make paper maps is transferrable. Shannon is a cartographer who coordinates DeLorme’s primary resource – an immense database of geographic information. Chip is a project manager for Outdoor Products; DeLorme’s niche is people in open country. Their detail regarding utility lines, railroads, and elevation changes is superior to any competitor. 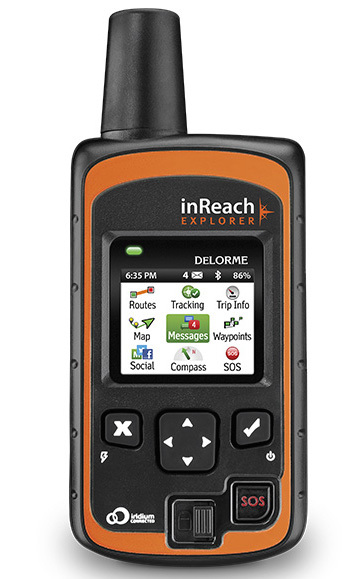 In 1997 DeLorme offered its first GPS tracking device, Tripmate, a cumbersome accessory connected to a laptop. In the ensuing years the focus has been on more detail and smaller devices. Their latest product, InReach is smaller than most smartphones, and can send information about your location, and send/receive text messages. In time, DeLorme’s subscription-based services will evolve into a smartphone app. As Chip says, “the platform doesn’t matter to us, they’re just different ways of applying our data.” Launch of the Android app was imminent when we met. DeLorme’s focus aligns with David DeLorme’s initial vision of getting people information where nobody exists. Hikers and adventurers are prime users, but companies involved in exploration – oil and gas, forest fires, humanitarian relief – find business applications. Chip says, “We track hikers, and we track assets”. DeLorme marks your route, tracks your progress, shares it with others, and creates web-based background information about the environment being explored.